1. Which type of figurative language does the cartoon depict? 2. Which of the following is the most appropriate title for this cartoon? Explain your answer. 1. b) irony. Irony is defined as a difference between what is expected and what actually occurs. 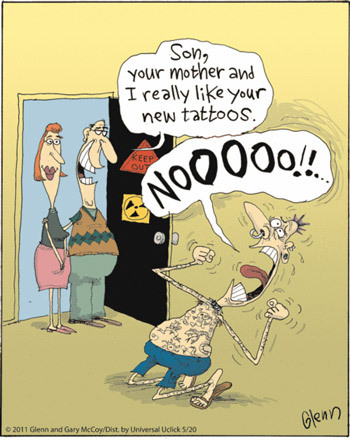 You’d naturally expect the parents to be upset with their son for getting so many tattoos – not happily telling him how much they like the new ones.